I have a lot of experience working with children who are deaf. After all, that is what I went to school for! I learned what they now refer to as an "old school" approach to teaching children who are deaf or hearing impaired, but I have to say I pull out the "old school" stuff a ton with A in trying to help him learn to speak English as well as the current stuff! 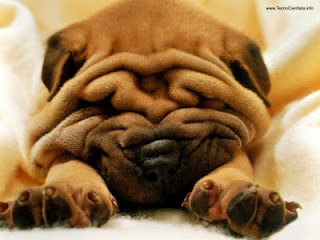 I think what I do the most is actually going to make me look like a Shar Pei breed of dog! I do the "wait with an expective look" on my face a lot. I get a lot of one word answers to questions so I do a lot of sitting and waiting with my eyebrows up and my head forward. I think my eyebrows inch up farther the longer I wait until I creep the kid out with my eyes the size of baseballs and my eyebrows becoming one with my hairline and my neck stretched out! I ask open ended questions instead of yes and no questions. He hates this! Me: "Tell me what you did today." Him: "Uhhh... Nothing!" (the eyebrows go up) "I can't say in English." (eyebrows are now up to my hairline) "Oh Come on!!!" (eyebrows inch up higher and head turns a little while my neck stretches closer to him) "I played soccer!" Me: "Where did you play?" I point out what other people are saying. When the other kids say something or something is said on TV that I think is interesting like waxing and mascara (not really) I ask A what was said. He can never tell me so the person has to repeat it and he has to listen and then tell. A lot of grumbling is added into the conversation. I by pass him for a lot of things so he has to ask for what he wants and if he doesn't the eyebrows go up again and I wait and wait and wait until he talks! I repeat what he says so he can hear it again. I repeat what others say so he can hear it a little more clearly. I repeat myself but by using different phrases. "yes, yup, ya, you bet, sure, certainly, of course" You never think of all of the different ways you can express the same thing until you have to stop and check for understanding or are asked to explain. So now I am turning into a non-stop talking Shar Pei! Bet A never thought America would be this cool! That's so funny! :) I'm sure the eyebrow motivates him to learn English faster! He will thank you one day! Over time, he did get better at nicely asking people to repeat themselves if he did not understand them.